WASHINGTON, DC, May 7, 2013 (ENS) – In her first foreign visit since taking office in February, South Korean President Park Geun-hye joined with President Barack Obama today to declare both governments’ intention to fight climate change. After what President Park called “a heart-to-heart talk, both leaders also agreed to stand firmly against North Korea’s threats of nuclear attacks, while at the same time cooperating on nuclear energy. “Given the importance of a peaceful nuclear energy industry to South Korea, we recently agreed to extend the existing civilian nuclear agreement between our two countries, but we also emphasized in our discussions the need to continue to work diligently towards a new agreement,” said President Obama. “As I told the President, I believe that we can find a way to support South Korea’s energy and commercial needs even as we uphold our mutual commitments to prevent nuclear proliferation,” Obama said. 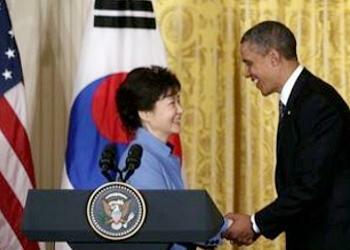 The first female President of South Korea, Park is leader of the conservative Saenuri Party. She is the daughter of Park Chung-hee, who was President of South Korea from 1963 to 1979. Yesterday, President Park visited Arlington National Cemetery with its memorial to United States’ Korean War veterans. Tonight, she will host a dinner to honor the generation of American veterans who have served in the defense of South Korea. On Wednesday she will address a joint session of Congress. Both governments are working towards implementing their 2020 mitigation pledges under the United Nations Framework Convention on Climate Change, UNFCCC, by developing low carbon economies. “Such actions will contribute not only to addressing the challenge of climate change, but also to building a more creative economy that generates new jobs and future growth engines,” the governments stated. Through its successful bid to host the Green Climate Fund, South Korea “has demonstrated its ambition in assuming a leadership role in addressing climate change, including providing support for and contributing to the GCF,” says the joint statement. Songdo, Incheon City, was chosen in October as the host city of the Green Climate Fund. The Green Climate Fund was established to channel support to the developing world to address climate change, and is currently in its set-up period. The Green Climate Fund is expected to be one of a range of funding channels to deliver on the long-term climate finance goal to mobilize US$100 billion annually in climate finance by 2020 from a range of sources, both public and private. The Fund will promote the paradigm shift towards low-emission and climate-resilient development pathways by providing support to developing countries to limit or reduce their greenhouse gas emissions and to adapt to the impacts of climate change. Both governments agreed to work towards “the early and successful operationalization” of the Green Climate Fund. In the multilateral context, both countries will continue to pursue a post-2020 agreement that is flexible and applicable to all Parties in the context of the UNFCCC. “We will also work together in the context of the International Maritime Organization, while respecting each other’s position, to further enhance energy efficiency and therefore reduce greenhouse gas emissions from international shipping,” they stated. In addition, we emphasize the importance of taking action to advance near-term climate change agenda, including through the Climate and Clean Air Coalition to Reduce Short-Lived Climate Pollutants to support the achievement of the ultimate goal of the UNFCCC. A bilateral dialogue between both countries will be held regularly to exchange views on the climate change negotiations. The Republic of Korea and the United States are engaged in a wide range of bilateral activities on climate change, particularly in the context of the recently approved 2013-2015 Work Program of the U.S.-Korea Environmental Cooperation Agreement. Under this agreement, the two governments will intensify cooperation in clean energy research and development, research on climate modeling, workshops on climate risk assessment and adaptation planning, and joint work on the development and adoption of smart grids and energy efficiency technologies that will produce new jobs and markets in this evolving sector.